Summary: RegCure PRO is one of the leading products in the market today with more than 60 million downloads. The cleaner comes with a vast library of error fixers, dll files, harmful process killer and other additions. It allows you to defrag and permanently delete files with just a click. Victoria, Canada / July 28, 2014 / With more than 60 million downloads, RegCure PRO is an insanely popular registry cleaner. It is one of the leading products in the market today and a trial version is also available. It allows you to defrag and permanently delete files with just a click. You are essentially getting to four great programs for free. It is super easy to use for a newbie and sophisticated enough for veterans who want to tweak it out. The simultaneous defrag and registry cleaner will seriously save you a lot of time in maintenance. The costumer service is also very good. The install is super small and uses almost no resources. RegCure Pro is packed with the tools you need to boost your PC's speed and performance. Featuring an intuitive interface and easy-to-use workflow, RegCure Pro scans common problem areas - and quickly and safely fixes them. As well, it has several tools and features to address other performance and computing issues. RegCure Pro has what you need to clean your computer as well as optimize it. The best way to improve your computer's performance is to start with a scan. This will tell you the current health status of your computer. 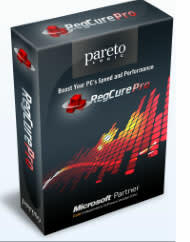 RegCure Pro is also compatible with the Windows 8 32-bit and 64-bit operating system. ParetoLogic, the makers of RegCure Pro, is dedicated to creating innovative solutions to common computer problems to help users of all abilities. The company prides itself on offering a quality customer experience – whether it is with its software or technical support. ParetoLogic software has been downloaded in over 196 countries, installed on millions of PCs, and solved countless computer problems around the world. 118 professionals have joined ParetoLogic at their headquarters in Victoria, B.C., Canada to research, develop, and support new products. Did the T-Mobile–Dish Rivalry Just Reach a Boiling Point?